Life, despite the comedian headliners, is a historical drama. Eddie Murphy, who originated the idea and also produced with film with Brian Grazer says, "The idea was a movie about two guys that went to prison for life -- a big prison escape film -- but with comedy". Yes, there is some humour in this film, and there are triumphs of the human spirit and acts of degradation and arrogance, it isn't a comedy, not even an (no pun intended) black comedy. Eddie Murphy & Martin Lawrence in Life. 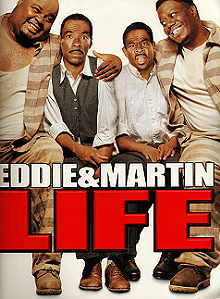 Nick Cassavetes, Eddie Murphy & Martin Lawrence in Life. Most people do not realise that after the abolition of 'slavery' in America, the method changed but the principle of free labour remained. The southern prison system provided thousands of free labourers to land owners, and it is one of these labour camps that is the setting of Life. 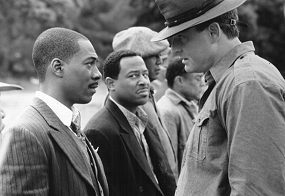 As we watch the characters from the time of prohibition until the present day, Murphy and Lawrence age so convincingly that I wondered if it was Lawrence in the end. Utlimately the subject matter is more important than the film, but it's an interesting glimpse into history.